The 80th Regiment of foot were one of several regiments used as light infantry in the French-Indian War. They adapted their uniform to the North American woods by cutting down their tricorns to caps, carrying light equipment, and abandoning the standard close order formation for a light infantry one. Light infantry here means a looser formation but still fighting very much as a unit. The emphasis seems to have been on faster movement and flexibility, rather than skirmishing as individuals. How were these tiny dudes done? These are Pendraken 10mm and I find they are well cast and easy to clean up. After preparation I sprayed them with a white undercoat. I used various acrylic paints and a Citadel brown wash over the warmer and brighter colours. Flesh is a mix of a tanned and pale tone to give an outdoor European base coat. Colours such as green and blue were a base coat followed by a darker wash. Finished off with a polyurethane satin varnish for protection. I used Flames of War plastic bases with magnetic stickies to keep figures secure and safe when carting them about. 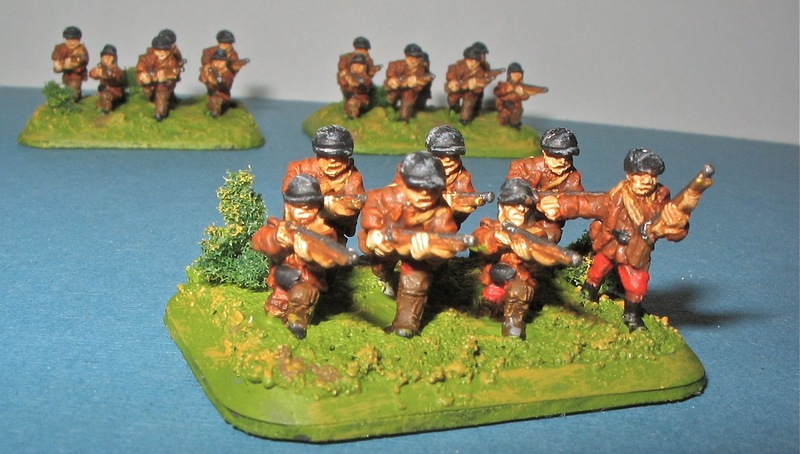 They were based in my usual way and then finished with Testor’s dull coat varnish. 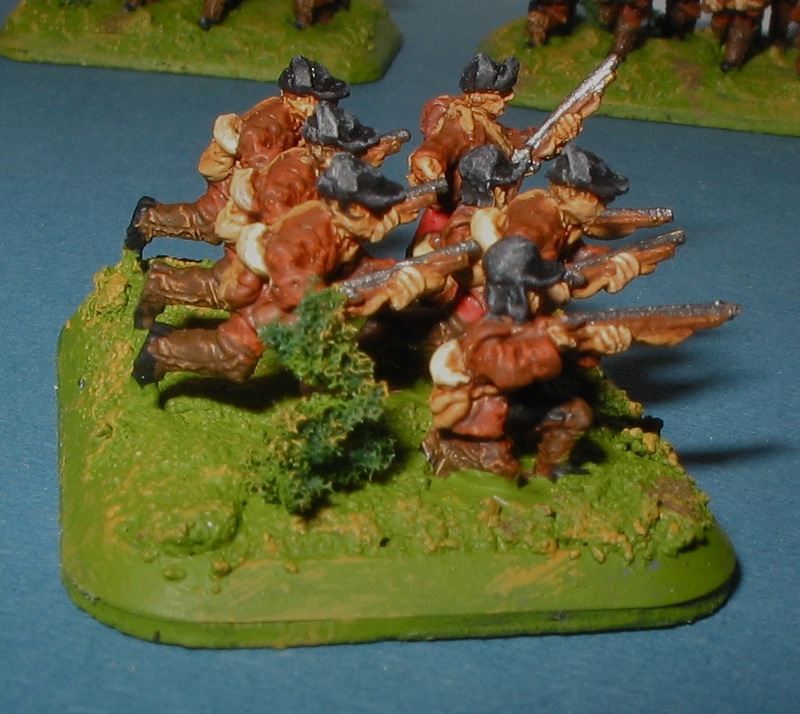 These figures are part of my French-Indian War project. The plan is to paint enough figures to have a reasonable sized engagement on my dining table. Using 10mm figures helps here! Another strand of the plan is to use Piquet Field of Battle rules and this is why I have based the figures as four elements. Always believing in having a plan B, I can use just three elements with Eighteenth Century Principles of War if Field of Battle proves not to my taste. Observant and informed readers will note that the bases are deeper than Principles of War specifies. This is simply becasue I like the ready made bases and the zone of control effect a deeper base gives. Oh, and more figures per base with space for odd terrain bits.